Like a fox’s call, discerning whether a human cry is in pain, exultation or fear is not always immediately evident. It is a haunting blend of such noises that first meets our ears in the opening seconds of The Levelling, setting an ambiguous duality of tone for Hope Dickson Leach’s debut. Our through-line is a family grieving in the immediate aftermath of a suicide and it’s a search for understanding and reason in this unsettling, slow-burning human drama which the writer-director weaves with remarkable emotional and narrative restraint. Accompanying howls of both glee and terror are disorienting flashes of revelry in which individuals dance naked over hot coals. What may sound like the ritual of a far flung tribe is in fact a group of drunken farmers in the English countryside but there is a dark, elemental heart at the centre of this quaint rural idyll. Exploring the interrelation and interdependence between man and beast, and indeed who holds dominion over the other, we get a bleak image of just how ruthlessly hard country life can be. Under leaden grey skies, the film delves into the mud and under the skin of the Catto family, reeling in the wake of Harry (Joe Blakemore) – one of two children – taking his own life at the climax of a party intended to celebrate his taking control of the farm from his father, Aubrey (David Troughton). 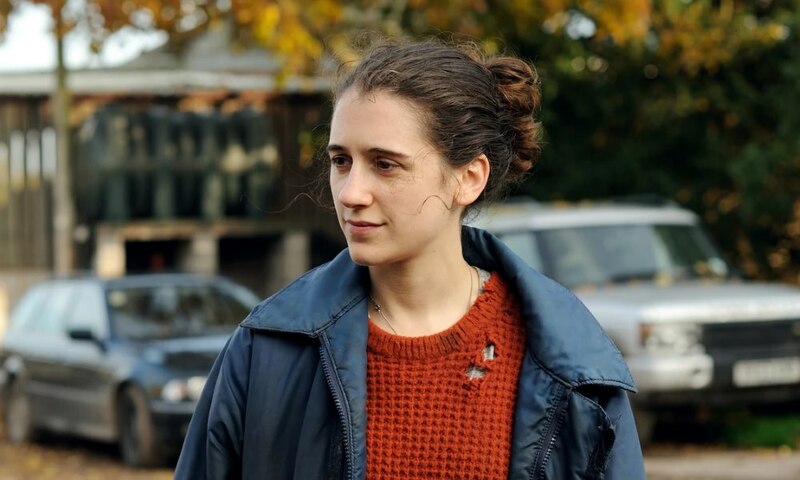 Shimmering with anger, confusion and anguish, Ellie Kendrick plays Clover, prodigal daughter and sister, who returns home from her veterinary studies ashen-faced and with scant sympathy for a father she addresses by his Christian name. Her standout performance is the film’s real backbone. With a self-enforced, measured poise that echoes Dickson Leach’s steady hand behind the camera, she seems at the point of breakdown throughout but manages somehow to keep it together. Her worn, desperate facial expressions and twitching, uncertain movement are followed intently by Nanu Segal’s attentive camerawork and effectively portray her character’s internalising of emotion and circumstances she simply cannot comprehend. Deep ditches are dug around the farm to prevent the recurrence of flooding which placed the family deep in the hole and similar diversionary tactics are employed when it comes to unearthing past ills, discussing what happened and who will take responsibility for the senselessness of the young man’s actions. Some semblance of normality comes in the daily routine of milking cows and maintaining the herd but though human kind may sit atop the food chain their future rests in the hands, or rather hooves, of the health and productivity of their stock. The pint-sized simplicity of this acutely well told and acted tale should not be underestimated. With secrets that Harry took with him reaching the surface and long-existing grievances laid bare, The Levelling hits peaks and troughs which make this plucky British indie an arresting, affecting watch.